When Third Millennium Equipoise first appeared 20 years ago the pressing global concerns centred on nuclear disarmament, UN Security Council reforms and human development goals. Global warming and climate change were distant threats at the periphery of global concerns. Discrete steps for dealing with future planetary threats, including nuclear disarmament, nuclear terrorism, UN Interventions of the 21st Century; and other critical issues should immediately be extrapolated from TME. In a recent interview given by Stephen Hawking that appeared in several newspapers he opined that extinction on Earth was closer than at any time before. He attributed it to anthropogenic factors or the coming of the anthropocene climactic that science and technology advances had put in the hands of humanity; the most proximate threats being nuclear weapons and climate change (or words to that effect). 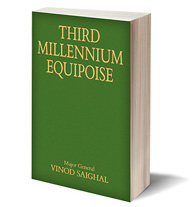 "Your Book 'The Third Millenium Equipose' is one of the most fascinating books i have ever read. This is the book all present leaders and those who care about the future of the planet earth should read "
"Touches on issues of priority concern to united nations in an enlightened and sophisticated way "
Chinese edition in the pipeline in 2016. Spanish title Equilibrio en el Tercer Milenio. Indispensable for COP-21 Paris Conference in December 2015 and finalisation of follow-up global protocols. Lays out matrix for speedier negotiation of global treaties. More importantly, their universal acceptbility and adherence. No opting out in the supreme national interest clauses in cases of critical global accords. General Vinod Saighal retired from the Indian Army in 1995 from the post of Director General Military Training. He has held an assignment with the UN peacekeeping forces as well as a tenure in Iran. He had served as the country's Military Attache in France and BENELUX, also overseeing Spain and Portugal..........Vinod Saighal was invited to join the 'Institutional Advisory Board' of USFSS (US Federation of Scientists and Scholars) in 2000. He is international consultant since 1995 with the prestigious French think tank Centre d'Etude et de Prospective Strategique (CEPS) as well as on the Institutional Advisory Board of an Italian Publication Geopolitica. He was a special invitee of the Chinese Medical Association as keynote presenter for the final plenary session of the 16th World Conference of IPPNW (International Physicians for Prevention of Nuclear War) in Beijing in 2004. “It is in India’s interest to see China strong enough to provide credible bi-polarity in the interregnum during which the world moves towards the establishment of a globally respected United Nations system; one which would be capable of enforcing its mandate without let or hindrance. At the same time it is vital to India’s interest to NEVER underestimate China’s threat potential”. Excerpt from a talk delivered at the United Service Institution by the writer in 1999 “Dealing with China in the 21st Century”*.